Summary: Learn a new way on quickly weaving your own cool and stylish homemade jewelry- a simple 3-strand woven friendship bracelet for boyfriends and girlfriends. It is really easy to follow! Every time we get to the shorts and sandals weather, I'd like stack my arms with a bunch of adorable bracelets and bangles. So here’s a tutorial of a DIY woven friendship bracelet with beads, you will love this surprisingly simple homemade jewelry. 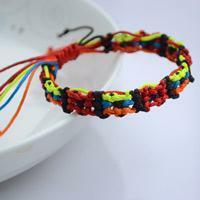 You can turn this design into a friendship bracelet for boyfriend or girlfriend. Let's start to weave this friendship bracelet. 7th, close off by tying another overhand knot. Leave 6mm and trim off all excess tails. 3rd, hook the clasp onto the jumpring and the DIY woven friendship with beads has been completed. 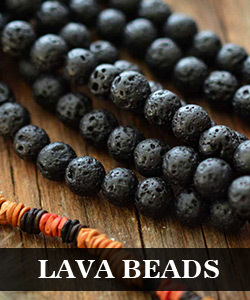 As a versatile jewelry design, there is a lot of room for variation with this pattern depending on the twines and beads you prefer and choose. No matter you make bracelet for male friends or femaled friends, this woven bead bracelet makes a great gift at any occasion and circumstance.